Hardscape North America (HNA) named Frank Bourque as the presenter for its live, continuous build hardscape demonstrations and unveiled the 2018 schedule. “The demos are a perfect opportunity to learn new installation techniques, and Frank will bring a new perspective to the popular sessions,” said Charles McGrath, executive director of the Interlocking Concrete Pavement Institute (ICPI). Focusing on how hardscape meets water, Bourque will teach attendees about installing hardscapes, segmental retaining walls and raised patios around pools and other water features for long-lasting results. 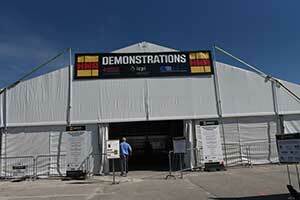 Each one-hour demo offers one continuing education hour for ICPI-certified installers. Attendees can add the hardscape demonstrations for $50 or upgrade their registration to the new VIP pass for access to all seven conference sessions, as well as the six demos, for a 50 percent discount ($189 member or $229 nonmember). HNA 2018 early-bird registration is available for $15 (fees increase after Thursday, Sept. 6). HNA registration includes access to both HNA and GIE+EXPO indoor exhibits, access to the 20-acre outdoor demonstration area, entrance to the HNA Hardscape Project Awards Presentation on Thursday, Oct. 18 and three free concerts at Fourth Street Live. Other education opportunities at the trade show include conference sessions, preshow installer courses and the HNA Dealer Network program.